Red Dead Redemption 2 is a big game, everyone at this point already knows that. You can spend dozens of hours exploring the game and setting miss most of the smaller details and secrets. This makes it a perfect game for a large community of mystery hunters. Red Dead Redemption What constitutes bizarre or strange is tricky to determine a game like Red Dead Redemption . Sometimes weird bugs and glitches can occur randomly. Remember the weird animal-people-hybrid players encountered in the original Red Dead Redemption ? Kotaku's Highlight Reel? Today on Highlight Reel we have well- meaning horses, head-turners, and much more! To the credit of the Red Dead Mysteries community, many players are quick to debunk most images or posts. Players responded to the sad cowboy who just lost a horse with different theories. "Could I have a wandered on the tracks and gotten clipped by a train?" Or "No mystery here is worse, it's either been clipped by the train or glitched out and died." Getting too close to a train. Though, there are ghost trains in Red Dead Redemption 2. The Red Dead Mysteries community has found some interesting things beyond dead horses. Many players have found different markings and carvings in the side of rocks and trees. The exact meaning of these markings has yet to be determined, but it certainly seems like something strange. Players also have found a possible pagan ritual site and even UFOs. Players are actually shooting at the UFOs, destroying the lights on the space craft which seems to cause it to freeze in place. Some mystery hunters can tell that this could be the next step in unlocking more UFOs. It is also a bit rude, honestly. Poor aliens. So what does all this mean? Well … nobody really knows. That's what many players are trying to piece together. What do all these clues, Easter eggs, strange maps and more actually mean? Are they all connected or are separate puzzles, waiting to be solved? 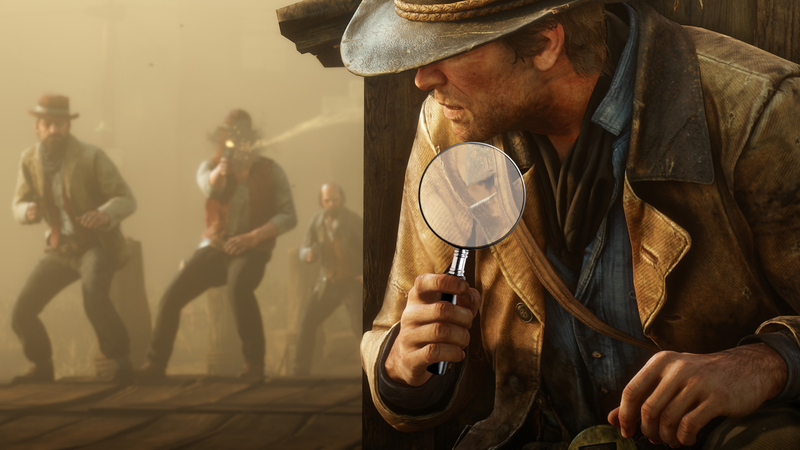 One of the most recent puzzles players used to piece together compasses that are dotted around the map of Red Dead Redemption 2. These compasses are pointing in different directions, so many players believed that they could all be pointing towards something. Maybe a new UFO? Maybe a hidden area? Maybe the third meteorite? While it may be disappointing that many of the different players are making discoveries, they are also being debunked, which also makes the hard-to-debunk mysteries all the more interesting. Players have already found two meteorites, but discovered that when collected the game tells the player they only have 2 out of 3 meteorites. Where is the third space rock? Players have different ideas, including the theory of the rock at the bottom of a lake. One player even contacted Rockstar and supposedly got a response, but I can't confirm if the email is real and even if it is, I not sure customer support representatives would have this information.Maybe this mystery is connected to a map of the stars players found a few months back? Dead Redemption 2 and GTA V together using time travel. One of the side quests in RDR 2 has players encountering a strange man who has a birthmark on his face. This birthmark along with other clues seems to imply that the man might be a time traveler and perhaps even connected to the Epsilon cult found in GTA V . Maybe the secret of Mt. Chiliad is actually hidden deep in RDR 2 ? If there are any more mysteries to be found in Red Dead Redemption 2 it seems almost certain the community will find them and solve them. Hopefully, all these clues and secrets have a more rewarding pay off than the sad search for the jet pack in GTA V . Those clues ended up meaning nothing and it was only years later that the jet pack was finally added to the game as part of a GTA Online update. So maybe this is all a wild goose chase or maybe, maybe it really is a third meteorite and it will unlock a big, crazy secret.